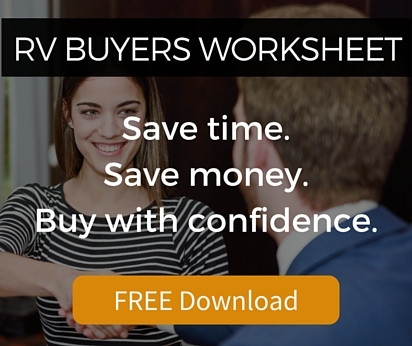 With over 2,500 new travel trailers to choose from in the marketplace this year alone, what makes one stand out in the crowd? One of the most popular items on the wish list for purchasing a travel trailer is slides. 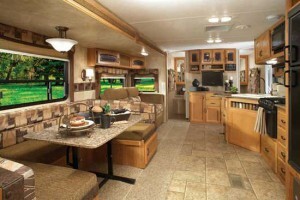 Slides can add extra space to your travel trailer for additional living, cooking or sleeping areas. Your fellow RVers have spoken with their checkbooks and below are the top 5 most popular, best rated travel trailers WITH slides for the 2017 model year. Criteria for Making the List: Choosing the ‘best’ of anything can always lead to debate. 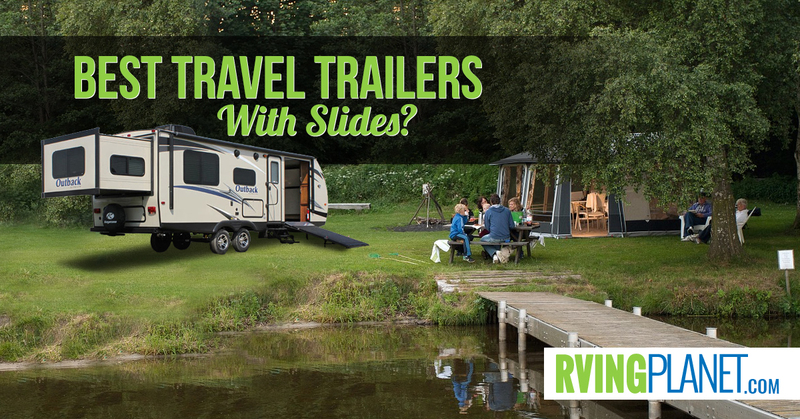 However, the top travel trailers with slides listed here, are ones that RV owners voted on with their checkbooks. 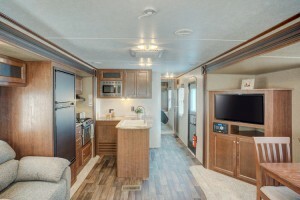 Based on quality, features, floor plan layouts, towability, and options, more people purchased these travel trailers than any others. Why RVingPlanet recommends the 2017 Forest River Flagstaff Classic Super Lite travel trailer: Number one on our list is one of the best values in the light weight market, the Forest River RV Flagstaff Classic Super Lite Travel Trailer. 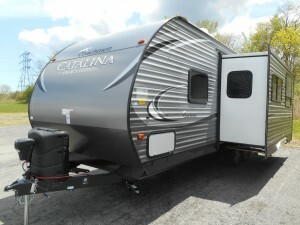 These travel trailers sleep up to 10 while still feeling spacious because they boast up to 4 slides! 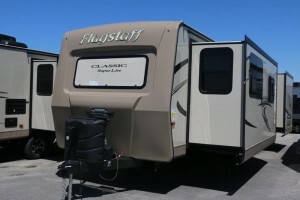 Take a look at some of the models with FOUR slides: Flagstaff Classic Super Lite 832BHDS and the Flagstaff Classic Super Lite 832BHIKWS. Some of the other great features in these models include bunkhouses for the kids, outdoor kitchens and two entry/exit doors. There are available details and options that set the Classic Super Lite apart from the rest. These options include Corian counter tops with a decorative tile backsplash in the kitchen, a fireplace for chilly evenings, and solid maple glaze finished cabinet doors, just to name a few. 5 out of 5 star rating! Available in 10 floorplans to fit your needs. Residential Serta Mattress Upgrade for extra comfort. Carpet and an Engineered Mold and Mildew Resistant Floor Covering. LED lighting saves battery life. Power Awning with Adjustable Rain Dump. 12 cubic-foot-refrigerator to store your fresh food items. Flush Mount Stone Cast Sinks With “High Rise” Lift-Off Kitchen Faucets. Theater seating provides ultimate TV watching comfort. Available upgrades in Diamond and Platinum packages. Why RVingPlanet recommends the 2017 Coachmen RV Catalina travel trailer: The Coachmen RV Catalina is one of the most comfortable travel trailers you will ever walk into. 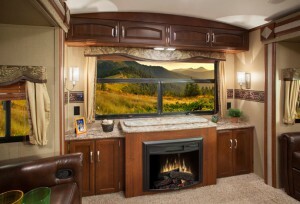 With a name you can trust like Coachmen you know you are getting a great travel trailer. 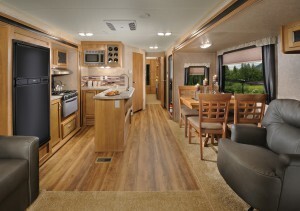 The Catalina provides you with a spacious living area and roomy bedrooms and bunkhouses. Extra room is provided with the additional slides that are available in the living and bedroom areas. Models with three slides include: Catalina 323TSQB, Catalina 333BHKS, and Catalina 333RETS. The extra features in the Catalina are what make it special. The fireplace in the living area and available fireplace in the master bedroom are sure to keep you toasty warm. 81″ ceilings ensure the spacious feeling and cozy finishes like decorative glass front cabinets have you feeling right at home. Available in 25 floorplans to fit your needs. 1-3 Slideouts for extra living space. Grace Cherry stained wood cabinets. Jack knife convertible sofa with sofa pillows. Double door refrigerator with reversible insert. Easy-View large picture window at dinette. Available upgrades include outside shower and outdoor kitchen. 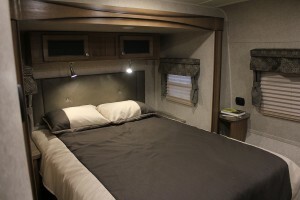 Why RVingPlanet recommends the 2017 Prime Time RV LaCrosse travel trailer: You won’t believe your eyes when you see the interior of the LaCrosse travel trailer. 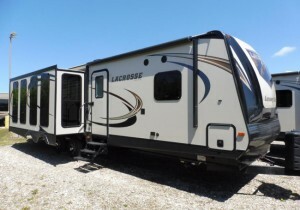 The LaCrosse provides premium space, storage and style all in one travel trailer. With options for up to 3 slides and 82″ ceiling height you can feel the extra room! Check out these models with available slides for extra space: LaCrosse 324RST, LaCrosse 326BFW, and the LaCrosse 329BHT. The LaCrosse has great features for traveling with family including bunkhouses, u-shaped dinettes and bathrooms with shower/tub combos. With fun options for entertainment systems including large screen TVs, no one can claim to be bored on a rainy day! Available in 14 floorplans to fit your needs. 87″ King U-Shaped Dinette for great meals or game nights. 82″ high ceilings for a spacious feel. “Evergreen” select foam mattress for a good night’s sleep. 18 gal/hr quick recovery mode for the water heater so no one has to take a cold shower. Why RVingPlanet recommends the 2017 Keystone Outback travel trailer: Super light weight, yet sophisticated and roomy, you’ll find the Keystone Outback travel trailer is a great choice. With upgraded furniture, vaulted ceilings and a stylish decor, you will feel right at home in the Outback. Lending to the spacious feel are the available slides in the Outback. 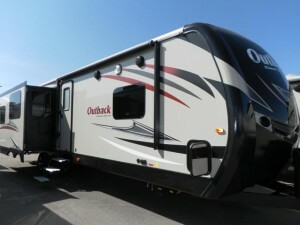 Here are a few models that give you slides for extra space: Outback 322BH, Outback 325BH, and the Outback 328RL. The fun thing about the Outback are all the choices you have! You can get a bunkhouse for the kids, an outdoor kitchen for your master griller and even a choice of a large rear entertainment center to please the movie buffs! Available in 18 floorplans to fit your needs. Deluxe sleeper sofa with arm bolsters. Beautiful hand glazed mystic maple cabinetry. Deluxe innerspring mattress for cozy sleeping. 36” flush floor slides – no tripping hazards! 8″ cubic foot residential refrigerator. 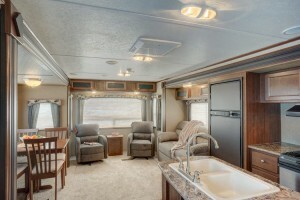 Available upgrades in the Designer and Comfort packages. 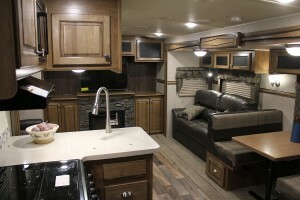 Why RVingPlanet recommends the 2017 Keystone Hideout travel trailer: The Keystone Hideout travel trailer is a great combination of luxury, features and camping convenience. 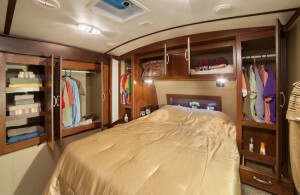 There is plenty of storage for all of your gear and all the comforts of home. Add an available slide or two combined with the 81″ interior ceiling height and you will feel like you are in your own palace on wheels! Available models with slides include: Hideout 31RBDSWE, Hideout 31RBTS and the Hideout 32BHTS. 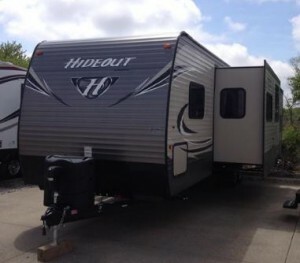 There are so many features that add to the fun of camping in the Hideout. 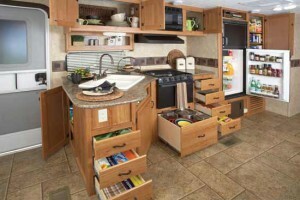 When you include the bunkhouse, the outdoor kitchen and u-shaped dinette you have so many options for spaces to enjoy! There are even models with two entries and a rear entertaining space that is great for busy families. Available in over 19 floorplans to fit your needs. 81” interior height for a roomy feel. HD LED TV for spectacular movie nights. 6 cubic foot refrigerator to keep your food fresh. Pre-drilled & screwed residential cabinetry throughout. Optional bunk rooms-great for the kids! 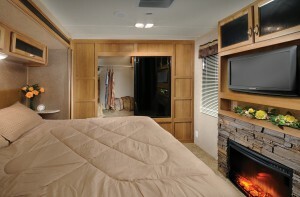 Travel trailers are a great way to take a family vacation. But no one wants to be cramped and slides are a great way to gain space so you can include more family and friends in the fun! 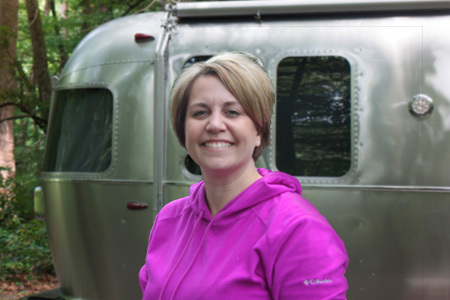 Travel trailers also have the benefit of being lightweight but sturdy and can be pulled by a pick-up truck or SUV. And perhaps the most convenient reason of all is that you can unhitch at your destination and still use your vehicle to explore. Not sure yet about any of the five trailers above? Checkout hundreds more here: travel trailers with slides.